Boswell Bestsellers for the Week Ending January 30, 2016. Here are the bestseller lists for the week ending Saturday, January 30, 2016. Oops, I hit create instead of save and wound up sending the uncompleted blog to our subscribers. I can't say it's been that sort of day because it hasn't. It's been fine! I'm at a gift show in New York with our gift buyer Jen and we found a lot of great things. New to the list this week is Dictator, the concluding entry in Robert Harris's trilogy on the life of Cicero. Stephanie Merritt wrote in The Guradian after its UK publication last spring: "Harris’s style is a curious blend of contemporary idiom (Pompey and Crassus are said to stand for election “on a joint ticket”) with Latin vocabulary so precise it requires a separate glossary; while the modern language may jar with historical purists, the research underpinning it is so meticulous that the reader feels wholly absorbed into Cicero’s world, and this is Harris’s real achievement. Dictator is a fitting finale to a trilogy that is likely to stand alongside the works of Robert Graves and Mary Renault as an enduring imaginative vision of the ancient world." Tom Holland also had a good review in The New York Times Book Review. Like Dictator, The Lost Tudor Princess: The Life of Lady Margaret Douglas came out on January 12, but had its best sales week two weeks later. The publisher calls her the beautiful, cunning niece of Henry VIII who influenced the succession after the death of Elizabeth I. I find it odd that though I can find Publishers Weekly and Kirkus reviews, and there are British reviews (here's the London Times, though you need to join to read it in full)I cannot locate a trade review from an American newspaper. Dare I say there might be a touch of sexism going on here? I cannot imagine this book completely snubbed were it to come from a man of Weir's stature. What an absolutely international list this in! In addition to having two authors in the top five from Sweden, with Katarina Bivald joined by national bestseller Fredrik Backman's A Man Called Ove, we have Lin Cixin from China, Jennifer Robson from Canada, Elena Ferrante, who we assume is Italian, and Magda Szabo from Hungary. I should also note that Charles Ries told me he has duel citizenship with Luxembourg. Backman's book in particular has been a huge hit nationally, and we're excited to announce that the author will be at Boswell on Saturday, May 14, 2 pm. You'll likely see another pop next week, as I'm announcing the book will be our April in-store lit group selection. Because we were a little short of paperback nonfiction that made the three copy cutoff for bestsellers in paperback, I extended paperback a little, being that these titles had sold the cutoff. I break ties by price point. I figure we've sold "more" of an expensive book than a less expensive book. That gets amusingly intricate when publishers are playing with even, 99, and 95 cent price points. We're all ready to discuss Voices From Chernobyl at the Monday, February 1 book club. I'll include the discussion in an upcoming blog. This week's bestseller lists include a few course adoptions. The Machete Season is being used by a university class, while The Glass Castle is on a high school reading list. Anna and the Swallow Man debuted this week, with Gavriel Savit debuting at Boswell this Wednesday, January 3. The London Daily Mail's Sally Morris writes of this novel about a young girl who survives by walking the Russian and Polish woods with the mysterious Swallow Man, "This wonderfully original concept, enigmatic in style yet grounded in brutal reality, is written with deceptive power and grace. Although it leaves questions hanging long after you turn the last page, this is a debut that promises great books from Savit." From Jim Higgins at the Journal Sentinel, a review of The Yid, from Paul Goldberg, a book he calls "remarkable." He notes: "Disclaimer: If swear words in Yiddish, Russian or English hurt your ears, if the occasional succinct gory description of the murder of a state-sponsored thug upsets your tummy, if putting a black man in whiteface or vice versa offends your conscience, "The Yid" may not be for you. But if you've always been fascinated by Yiddish theater, this is your novel. Goldberg draws on Levinson's past involvement in a production of King Lear to cast Stalin himself as a degraded Lear; there's even a thug improbably named Kent." I think it's interesting that Gariel Savit coincidentally has a background in Yiddish theater. Higgins also highlights Madison writer Dean Robbins, whose new book, Two Friends: Susan B. Anthony and Frederick Douglass, will be featured at a February 2 event at Boswell. The talk begins at 7 pm. And Mike Fischer reviews Darryl Pinckney's Black Deutschland, also in the Journal Sentinel. I read and enjoyed Mr. Pinckney's High Cotton years ago and enjoyed it; I wish I had enough time to keep up with so many great writers. Of the newest, Mr. Fischer wrote: "Jed makes clear that even when one is a privileged member of the Talented Tenth, race in America always gets in the way of one becoming oneself. It's no accident that this book invokes ex-pats including W.E.B. DuBois, Nina Simone and Josephine Baker — although not Richard Wright, another onetime Chicagoan who'd sought refuge in Europe, writing a novel there featuring a similarly isolated intellectual. Pinckney's writing is much cooler; Black Deutschland not only channels Isherwood, but also suggests Ellison's Invisible Man and Teju Cole's more recent Open City — each one the tale of an outsider whose sharp observations and sometimes sardonic humor are partly made possible because all three are more comfortable watching than participating." This Week's Events: Lindsay Starck, Amy Cuddy, Jessica Chiarella, Charles P. Ries, and Nicholas Petrie (twice). Here are the bookish events going on around town that Boswell is cosponsoring. featured title: Noah's Wife, a novel. Jane Glaser's recommendation: "This is a beautifully written story of a town whose existence is threatened by endlessly drenching rain and for whom the townspeople appear to have lost all hope. The arrival of the newly assigned minister, Noah, cannot seem to break through their despair as he begins to have his own crisis of faith. As the waters rise and threaten the viability of the town's zoo, its main tourist attraction, it is Noah's wife who leads a small band of townspeople into rescuing the animals and relocating them in the town's abandoned shops and people's houses, lending a bit of gentle humor to the story. Yet, when that effort and sandbagging can no longer hold back the advancing flood risk, the citizens, along with the animals, move to the highest point in the town, the church. Readers will fall in love with an unpredictable cast of characters who truly realize what it takes to rely on each other and ultimately come to share a renewed sense of hope as an unsinkable community!" From Jim Higgins's profile in the Journal Sentinel, with Starck discussing her favorite childhood books: "'I had my favorite books. I was a reader who found a book I love and I would just read it over and over and over again,' said Lindsay, citing The Indian in the Cupboard as one of those favorites. She also devoured the Sweet Valley High and Sweet Valley Kids books repeatedly, to the point that a children's librarian noticed and tried recommending other books to her. 'I felt a little embarrassed, and afterward I'd read Sweet Valley High in secret,' she said." Central Library is located at 814 W. Wisconsin Ave. At this time of evening, there is usually a good amount of street parking and there is also a lot on the south side of Wisconsin. The Reading Room is on the 1st floor. Anne McMahon's recommendation for The Drifter: "This is such a great novel. The characters are unforgettable, the story is compelling, and the setting is local - an added bonus. Not to be missed!" From Bobby Tanzilo's OnMilwaukee.com column, before he asks Petrie some questions: "Has a book as gripping and engaging as Nicholas Petrie's crime novel, "The Drifter," ever been written about Milwaukee? Interweaving terrorism, homelessness, veterans and Riverwest, the book is a compelling page-turner. I'm not going to recount the story here because I don't want to spoil a second of it for you, but rest assured, when you switch off your phone and pick up the book, you'll recognize the places Petrie describes in his debut novel, published by big-time publishing house, G.P. Putnam's Sons." Read the interview here. The Whitefish Bay Public Library is located at 5420 N Marlborough Dr. in Whitefish Bay, just south of Silver Spring Drive. Sharon K. Nagel's recommendation for And Again: How much of a role does your body play in determining who you are? Do memories live in your skin and your nerves or just in your brain? These are the questions raised in this excellent debut novel by Jessica Chiarella. Four people with terminal illnesses are chosen for a secret and experimental procedure in which their brains and memories are transplanted into healthy bodies. Hannah is an artist with cancer, David, a congressman with a brain tumor. Connie, an actress with AIDS, and Linda, a wife and mother who has been paralyzed after a car accident. The new bodies are not only without disease, they are perfect, completely without freckles, wrinkles, tattoos, or scars. It sounds like a miracle, but all types of change require an adjustment, and all of the patients find that the transplant may not be the dream come true that they signed up for." Here's Jessica Chiarella's profile in the Chicago Tribune. (Photo credit Shane Collins.) On how she was inspired for the idea: "Chiarella drew inspiration for the story from a variety of places — a growing interest in holistic nutrition, the search for the so-called magic pill and contemporary novels such as Never Let Me Go and Look at Me - but found a conversation with an acquaintance who had undergone gastric bypass surgery to be one spark. 'She had a very interesting perspective on it because she was getting a lot of attention that she had never gotten before,' Chiarella said. 'Her response to it was very much like, "I don't understand, am I more interesting now than before or is it because people perceive me differently?" That fed into me this idea that your body is tied into society's impression of you.'" who: a ticketed event with Amy Cuddy, in conversation with Bonnie North. This event is cosponsored by WUWM. Daniel gives you the lowdown on Presence: "Amy Cuddy, a social psychologist and associate professor of business administration at the Harvard Business School, has won renown for her popular TED talk on how changing your body language can make a big difference in your ability to accomplish goals and lead. In her new book, she shows the steps leading to this breakthrough, starting with creating engagement and channeling anxiety into energy. She looks at the body language of power and submission, and shows there’s a tendency for women to ape the body language of passivity, generally starting sometime in middle school. The impostor syndrome plays a role into ceding positive energy, and while women are quite willing to admit to this, it turns out that in anonymous surveys, it affects men in large numbers as well. But just like smiling can make you happier (thank William James for that revelation) and yoga poses can lead to health and vitality, these power poses can lead to confidence and success. Just ask the All Blacks rugby team of New Zealand…or Wonder Woman." From her All Things Considered interview with Lisa Mullins: "I’m more concerned that we have a lot of people in the world feeling powerless, not powerful. Recently I heard from a teacher who works with students with disabilities. He was working with a fourth grader who has selective mutism, which is an anxiety disorder that makes it very difficult for children to speak when they’re in social situations. The social threat is intense for them. So he taught [the boy] about power posing, taught him that lots of people feel like impostors, and lots of people feel scared, and slowly nudged him to speak a little bit more each day in class. He now has that student leading discussions. That’s a story that I think is amazing." Daniel's recomendation for The Drifter "When Peter Ash finds out that his former Marine buddy committed suicide, he shows up at his widow’s house to help with some home repairs. Under the crawl space, he finds a mangy dog and a mysterious suitcase filled with cash. Needless to say, the contents are much desired by another party, but that’s just the tip of the iceberg. Nicholas Petrie has written a compelling thriller that knows all the right moves, from the loner character to the family in peril to the multiple plot turns, but infuses a fresh twist with Peter Ash, a vet with PTSD manifested in acute claustrophobia. There’s a bit of an Elmore Leonard vibe going on here, only with everyone playing at more contemporary higher stakes. And as a bonus for locals, the Milwaukee setting is distinct, but not so over-detailed to get in the way of the nail-biting plot." For a change of program, this event is Petrie in conversation with library director Gary Niebuhr. The Greendale Library is located just south of Grange and west of Loomis, sort of in the backyard of Southridge Mall. From Allison Thompson in the Sheboygan Press, discussing what the author calls a fictional memoir. : "Growing up on a mink farm on Sheboygan’s south side as one seven children gave Ries much fodder for the book. 'Five of the seven went to the convent or seminary,' he said. 'I like to say I grew up in the most Catholic family in America. 'The Fathers We Find is a coming-of-age story that takes place in Sheboygan between 1950 and 1971. The narrator, Chuck, is influenced by many who cross his path while growing up. 'We don’t get to pick our fathers, but sometimes we are lucky enough to get our fathers to find us,'” he said. From the Charles P. Ries collection at Marquette: "Ries often refers to his work as “a mash-up of the secular and the spiritual, the ordinary and the mystical.' He readily admits his early life experiences had a strong influence on his creative writing and what he hoped to accomplish through it. Ries grew up in a very devout Catholic family. Of his six siblings, five entered the convent or seminary. It was this early and deep immersion into Catholicism that would later fuel his own search for God. After college he lived in London and North Africa where he studied the mystical teachings of Islam called Sufism. In 1989 he worked with the Dalai Lama on a program that brought American religious leaders and psychotherapists together for a weeklong dialogue. It was during this same week that the Dalai Lama was awarded his Nobel Peace Prize. Ries has done extensive work with men’s groups and worked with a Jungian psychotherapist for over five years during which time he recorded five hundred dreams and learned to find the meanings in small things. He is a third degree Reiki healer, and has received advanced yoga training." Hope to see you at one of this week's events. 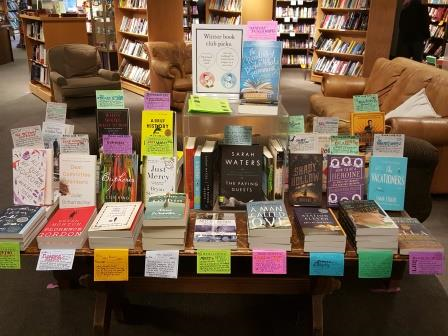 It's the annotated Boswell bestseller list for the week ending January 23, 2016. Here are our bestsellers for the week ending January 23, 2016. Hey, we had a nice pop in sales on Sunil Yapa's Your Heart is a Muscle the Size of a Fist. At least a couple sold off my staff rec shelf, so I'm happy about that. Alas, Mike Fischer didn't like it so much (see below). Benjamin Rybeck in The Houston Chronicle wrote: "Your Heart Is a Muscle the Size of a Fist captures sustained energy - the sense of a situation whirling out of control. The protest becomes more violent, the book becomes noisier (cacophonous almost, with chants, grunts and shouts), and each character watches somebody get beaten. In these moments, Yapa keys into the physiological effects of witnessing violence. Victor in particular wants to witness, and by witnessing make (the violence) real, unable to be forgotten.' But on the next page, Yapa drops all literary pretension and provides a line of blunt power: 'Oh God, Victor was scared.'" It's a second very strong week for My Name is Lucy Barton, which exploded at #1 on the New York Times bestseller lists. That gave the Random House division of Random House #1 on the fiction and the nonfiction lists, with When Breath Becomes Air also taking the top spot. And yes, we had a great week with The Drifter without any events. There are two more next week, on January 27 and 29. Details in tomorrow's blog. Several books of note should have strong showings on the New York Times next week, most likely led by Dark Money: The Hidden History of the Billionaires Behind the Rise of the Radical Right, by Jane Mayer. The story behind the story of Dark Money is as interesting as the story itself. Here are pieces about the book in The National Review and Mother Jones. Because the book skews left, it will not duplicate our sales at mass merchants, most likely tempering its position on national lists. But it really depends what the competition is. I was amused to see though we've been selling lots of Star Wars stuff, particularly in kids, we have yet to sell a single copy of Star Wars: The Force Awakens, which has been at #1 and then #2 on national lists. We had some space so I moved it up to "new and noteworthy." Let's see if I can fire sales into the single digits with this placement. You can guess it's a presidential election year by seeing more political books in our top 10. But maybe we can detour to Great Britain, where Bill Bryson's newest book is a return to what broke him out internationally in Notes from a Small Island. Here's Griff Witte in the Denver Post writing about Bryson's newest curmudgeonly UK travelogue, The Road to Little Dribbling: "Bryson seems to go out of his way to avoid actually interacting with the British. And when that fails, the result is typically a contest to determine who can be crankier. He spars epically with a McDonald's cashier who scrambles his order, and he fantasizes about clubbing to death a dog-walker who refuses to clean up a freshly befouled trail." I noticed that all the national lists were combining film and non film tie in editions for all the movies out, but it really adds another step to our process and I generally hope that one of the editions (generally the non tie-in, which will generally do better in our store) will pop alone. That said, with the number of books I'm scanning down from December (dramatically), I thought the list was small enough to match up sales and that affected three titles, including Brooklyn and Carol/The Price of Salt. Since the editions really are identical, aside from the jacket and in one case, the title of the book, it seemed fair. It's just that I can't say I can consistently do this, so enjoy it this time. The Oscar nominees seem to have an unusually large number of book origins this year. Even Spotlight has Betrayal: The Crisis in the Catholic Church: The Findings of the Investigation That Inspired the Major Motion Picture Spotlight. Since the film has been down the block for weeks, we're hoping that featuring this Boston Globe book, originally published in 2002 with a slightly different title, will get a sales pop in the coming weeks. Another book that benefitted from me researching various editions is The Big Short, by Michael Lewis. I did a lot of research on tie ins coming back in September and for some reason, this did not come up on my radar, as I realized that I left it off our film table sign. That is remedied, with us taking off some of the titles that have come and gone, like The 33. Maybe Deep, Down, Dark would have also been a perfectly acceptable film name, and then you would have had all the awareness from the book. More and more you are seeing that a successful book is a leg up, right? I'm excited to see The Revised Fundamentals of Caregiving, by Jonathan Evison, is finished and debuting at film festivals. It features Selena Gomez, who was the musical guest on Saturday Night Live last night. As our trade buyer Jason recently said to me, Valentine's Day is a kids book and gift (nonbook) holiday but it's tough to have adult titles that work for gift giving. Aside from Roger Rosenblatt's The Book of Love: Improvisations on a Crazy Little Thing, which we recently added to or display, indeed it is the children's books that drive the holiday sales at Boswell. One title on our bestseller list this week is Olivier Dunrea's Ollie's Valentine, a new board book in Dunrea's Gossie and Friends series. I looked for a roundup of new Valetine's Day books, but the one I found was clearly from an aggregator and was filled with previously released licenesed-character driven titles with Valentine in the tile. Alas, not really helpful, and it would miss a book like Sherri Rinker Duskey and Patrick McDonnell's Silly Wonderful You, a book with no Valentine heart on the cover, but is definitely about love. I mentioned that Mike Fischer reviewed Sunil Yapa's Your Heart is a Muscle the Size of a Fist. He was dismayed by the clumsy metaphors and bad writing. He's not necessarily alone, though Jenny Hendrix's New York Times Book Review was a bit more nuanced. I guess that sort of didn't bother me, as I was much more interested in the relationships between the characters, particularly the father and son on opposite sides of the skirmish. And hey, Ron Charles at The Washington Post is a fan. He writes: "What is so enthralling about this novel is its syncopated riff of empathy as the perspective jumps around these participants — some peaceful, some violent, some determined, some incredulous. Constantly moving to “one more story among a thousand such stories,” Yapa creates a fluid sense of the riot as it washes over the city. Your Heart Is a Muscle the Size of a Fist ultimately does for the WTO protests what Norman Mailer’s Armies of the Night”did for the 1967 March on the Pentagon, gathering that confrontation in competing visions of what happened and what it meant." --The Ex, by Alafair Burke is the newest novel to feature criminal defense attorney Olivia Randall. Barrowman writes that "with her pacey plot and fascinating characters, Burke proves she's at the top of hers as a writer." --Medusa's Web, by Tim Powers channels old Hollywood in its present-day Los Angeles setting. Barrowman calls this an "ingenious supernatural mystery that snagged my imagination from its opening pages." --False Positive, by Andrew Grant is a terrific new mystery featuring "Alabama detective Cooper Deveraux, driven, dedicated, but deeply flawed with a hair-trigger conscience and a history of violence." He gets "a new partner and a troubling new case with a kidnapped foster child at its center." Also in the print edition is a review of The Vatican Prophecies: Investigating Supernatural Signs, Apparitions, and Miracles in the Modern Age from Peter Smith in the Pittsburgh Post-Gazette. From Smith: Veteran Catholic journalist John Thavis explores their world of Marian apparitions, relics, exorcisms, doomsday visions, and other purported encounters with the supernatural." And finally I'm glad I got a heads up on Jim Higgins' profile of Lindsay Starck, author of Tuesday's debut, Noah's Wife, as it was in page 2 of the news section of the Journal Sentinel and I might have missed it. "I had my favorite books. I was a reader who found a book I love and I would just read it over and over and over again," she told Higgins. Starck attended University School and Yale, and then decided to make writing her career, detouring from a life in law. Join Starck at the Milwaukee Public Library reading room for a launch of her novel, Noah's Wife on Tuesday, January 26, 5:30 reception, 6 pm reading. if you'd like a review, check out Kim Kankiewicz's take in the (Minneapolis) Star Tribune on this "impressive debut": "Although Noah's wife eventually comes into her own as a protagonist, her story is but one of many in the novel. Starck devotes entire chapters to several supporting characters, including eccentric townspeople and inhabitants of the city Noah and his wife have left behind. Starck's talent is on display in her vivid portrayals of these characters. We learn about their fears and foibles and greatest desires. We see where their allegiances lie and how they respond when their fidelity is tested." New Book Club Brochure: Bettyville and 12 other new titles featured, Jennifer Morales offers Skype meetings, Jane has an official "Readers of Broken Wheel" recommendation. My goal is to update the book club display three times a year, in January, May, and September. If we have late editions, or schedule paperback events that would make a good book club discussion, the idea is to do an insert. But when I updated the list just now, a clever bookseller asked, didn't you just update this in November. The answer is yes, to the second practical answer is that when we run out of fliers, sometimes it makes more sense to add fresh titles and take away the things that aren't working instead of waiting. But we had so many good books featire that we decided to create an insert of six title right away, giving us an assortment of thirty books. The idea is that the insert titles come out in March. I also wanted to update the selection because I wanted to start spreading the word about Bettyville, the beloved memoir by George Hodgman that comes out in paperback on February 2. He's visiting Boswell on February 10 (7 pm), and while I knew much about the book, all the great reviews, and that it was a New York Times bestseller, I really didn't know how passionate folks were about Bettyville until I read the book and started bringing the book and event up in conversation. I am always looking for a nonfiction book that is both readable and discussable and I'm thinking that book clubs will really gravitate to this, particularly ones where folks of the age where they are caring for their parents. One book that is not so new that we've added to our book club table is Meet Me Halfway, by Jennifer Morales. This story collection has been out since last spring and while we generally do not feature more than one collection of stories, I think these tales have enough of a through line and interconnection that folks will appreciate them as a continuous narrative. Racial understanding and misunderstanding is at the heart of her stories, and the book would be an interesting book to read in a series with say, Between the World and Me, Ghettoside, or our featured Just Mercy, Bryan Stevenson's book about his attempt to exonerate a black man on death row. Please note that Jennifer Morales can meet with your club via Skype, Google, or Face Time. Our in-store lit group has found this very enjoyable. We had a particularly enlightening visit with Rebecca Makkai. The key is to schedule time without the author to hash things out first, and it's always important to be polite and not criticize. That's for your alone time. To schedule your virtual visit from Jennifer Morales, please email info@moraleswrites.com by January 31. I should also note we have our third printed recommendation on The Readers of the Broken Wheel Recommend. Jane has been spearheading our promotion of this book, and is a core member of Team Broken Wheel. I have passed my copy on to Sharon, who will then give it to Anne. We'll see how this continues. Jane Glaser's recommendation: "I love books about books and this beautiful story is about how a small dying Midwestern town is regenerated with the arrival of Swedish bookseller, Sara Lindqvist, who has come to meet her bookloving pen pal, Amy Harris, only to find out that she has died. The townspeople of Broken Wheel, Iowa, in mourning for their beloved Amy, invite Sara to live in Amy's house. Rewarding this hospitality and honoring Amy's memory, Sara opens a bookshop, inventoried with Amy's vast collection of books. As Sara is determined that everyone who lives in Broken Wheel will be matched with just the right book, this community of diverse and engaging characters come to know the transformative power of living between the pages of books...and beyond! This is an inspiringly perceptive and heartwarming ode to reading that booklovers and book clubs will want to add to their list of favorites." Readers of the Broken Wheel displays--two of them with a third to come--plus info about the contest. 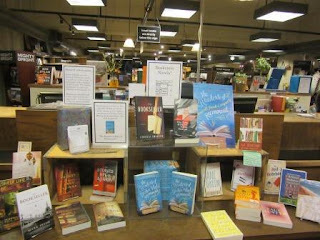 We are so excited about The Readers of Broken Wheel Recommend that we have put together a special display and promotion. Featured are some of our favorite novels and story collections set in bookstores. Yes, we did this display last year too, but we came up with some new ones. But after brainstorming with Jane and Jen, also known as Team Broken Wheel, we came up with a twist. We're putting together a Readers of Boswell Book Company Recommend. Customers can submit a recommendation of their favorite book on one of our entry forms. We will select the best recommendations, based on the book and the rec itself. Please note that we are not taking any email or Facebook or Twitter recs. You have to come in the store and fill it out. And based on how many of you have wanted to have a rec shelf talker in the past, we know we'll get plenty! And I assure you, there are more where those came from! 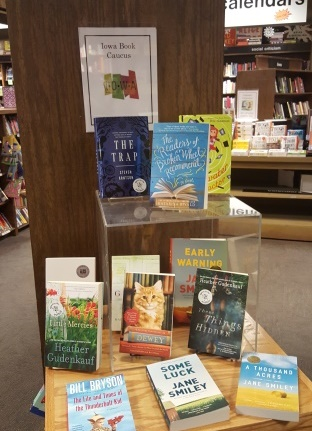 At the same time, we were setting up a mini-display called Iowa Book Caucus, featuring books set in Iowa, and lo and behold, The Readers of Broken Wheel Recommend fit that bill too. Included are the novels of Marilynne Robinson, Heather Gudenkauf, and several of Jane Smiley's works, most notably A Thousand Acres and her current trilogy of Some Luck, Early Warning, and The Golden Age. We've got nonfiction books like The Life and Times of the Thunderbolt Kid and Dewey and kids books like Steve Arntson's The Trap and Jacqueline Woodson's Beneath a Meth Moon. Of course the perfect book for this display is Corn Poll: A Novel of the Iowa Caucus, by Zachary Michael Jack, published by Ice Cube Books. Now get to Boswell, take a look at the book, and start thinking about what book you'd submit! Oh, and of course you can also vote for us as your favorite bookstore. We're excited that for the first year since we've been open, we've won Best Bookstore in Milwaukee in the Shepherd Express Reader's Poll. We won once before but that year they separated out chains, so we didn't compete with Half Price (the usual winner) and Barnes and Noble. So I guess we're getting cocky enough to think we'd have a remote chance of winning this. Oh, who cares? We like the book and if it gets more folks talking about Bivald's novel, so much the better. Here's another link to voting. A Blog in Three Sections: 1) This Week's Event 2) Daniel Reads "One Child" 3) Daniel reads Marian Thurm's New Short Story Collection. We've just got one event this week! It turns out that our evening with John Hagedorn, author of The In$ane Chicago Way, conflicted with an important community meeting. Fortunately, we we able to reschedule Professor Hagedorn for Friday, February 19, 7 pm. Cross out and remark your calendars! On Thursday, January 21, we're cosponsoring the first event of 2016 at the Lynden Sculpture Garden. The Women's Speaker Series, produced by Milwaukee Reads and cosponsored by Bronze Optical, presents Jennifer Robson, the historical fiction writer who has already written After the War is Over, and Somewhere in France. Robson is a phenomenon in Canada, where she recently had two titles on the Toronto Star top ten. Renée Rosen, who most recently visited the Lynden Sculpture Garden for her novel, White Collar Girl, offered this praise: "Robson is a master of evoking atmospheric detail that transports readers back in time and place. I loved every page!" Tickets are $25, $20 for Lynden members, and include admission to the event, a copy of her new novel, Moonlight Over Paris, and light refreshments provided by MKE Localicious. You can register on the Lynden website or call them at (414) 446-8794. The sculpture garden is located at 2145 W. Brown Deer Rd. in River Hills. For folks who are in the Chicago area, Robson will also be at Andersons on January 20 and Women and Children First on January 22. While recently visiting my sister Claudia, I brought her some books for her library. Since she teaches Chinese, one of the titles I brought along was One Child: The Story of China's Most Radical Experiment, by Mei Fong. But than for some reason I finished the two books faster than I expected and made her a deal - I would temporarily ungift One Child and send it to her later. The book was meant to come out later in the spring and while they moved it up, I wondered if the finished copy was edited to reflect China's recent acknowledgement that they were going to formally end this experiment. Per Fong, they had already pierced holes in the policy, so that for example, rural and ethnic minorities were not subject to the restriction, nor were families where both parents were only children. That said, Fong's book, which is more of an overview of the policy and its implications than a continuous narrative, shows that the implications over this policy will last well into the future. Back in the day when I could read 15 books a month and was carefree regarding what I read (as opposed to now, when 50-75% of my reading is driven by event programming), I was a voracious devourer of short stories. It was not unusual for my favorite book of the month (for of course I rated them) to be a collection, like Francine Prose's Women and Children First (do you think Prose read at the Chicago store when her book came out? ), which I liked more than many of her novels. I still think about how Pittsburghy the stories of Sharon Dilworth were and immediately had to look up the name of her first collection, which was Women Drinking Benedictine. Along with these writers was Marian Thurm, one of those writers I was always cheering on, but just couldn't seem to get a break, as she changed publishers with almost every book. Hey, at least she was published! Amusingly enough, three of her first four books were published by Viking, Random House, and Bantam, which are now all sister imprints. The fourth was at the Ann Patty-led Poseidon Press, which published the first book of Thurm's that I read, These Things Happen. I was a Poseidon Press groupie in those days, and am amused that the Wikipedia entry is only concerned with the fantasy and horror, though I must admit publishing George R.R. Martin early in his career is worth a shout out. Admittedly I was more of a fan of the short stories than the novels, at least until The Clairvoyant came along, which I loved. Alas, it never actually came out in a trade paperback, moving from a Zoland hardcover to a Harper mass market. I kept waiting for them to convert it to trade, but I don't think it did well enough for them to try. I was very excited to see Today is Not Your Day come from Sixoneseven books. We'd previously hosted an event with their author Douglas Trevor, author of Girls I Know. So it turns out that Thurm did publish two books with one publisher, St. Martin's, only it was under the pseudonym. But I should note she did also did two books with Bantam. And keeping with her track, it turns out her next novel comes from Permanent Press. It's called The Good Life and comes out in April. So far I've hand-sold one copy of Today is Not Your Day, to my friend John, who was another reader of Thurm from way back. It's the Annotated Boswell Bestseller List for the week ending January 16, 2016--on new books by Elizabeth Strout, Paul Kalanithi, Katarina Bivald, Nick Petrie's launch, the ALA winners, and more. Here are the Boswell bestsellers for the week ending January 16, 2016! The big story this week on nonfiction is When Breath Becomes Air, by Paul Kalanithi. Our rep John contacted us a week ahead of time warning that this might be a blowout, but you have to be careful about these things, because, well, they aren't always blowouts. But that New York Times review from Janet Maslin a week before pub date had our phones ringing. From Maslin: "I guarantee that finishing this book and then forgetting about it is simply not an option." Nora Krug in The Washington Post says "His words are bracing for their honesty." And Anna Reisman in Slate writes: "For the most part, the memoir’s first half feels familiar: yet another well-written young doctor memoir that would have been more interesting if he’d waited it out for a few years and gained some perspective. But Kalanithi understood this. He loved writing but realized that neurosurgical training and an active writing life were not a feasible mix. His original life plan, he writes, was to practice as a neurosurgeon for a few decades and then write a book. But with his diagnosis—and with his first, and only, child on the way—time was of the essence." After two week's of nice sales, Readers of Broken Wheel Recommend explodes in sales! Well, explodes as much as a book can explode in January. Jane and Jen have been furiously championing the book and we'll have a special post about the book later this week with our new display, contest, and backstory. It's a good second week out for Jo Nesbo's Blood on Snow. Alison Flood in The Guardian writes "It’s all ever so noiry and pulpy: Nesbø’s gorgeously rendered images of snow, and of the titular blood on snow – “the snow sucked the blood up as it fell, drawing it in under the surface, hiding it, as if it had some sort of use for it” – are crying out to be filmed. (Warner Bros, incidentally, is planning to adapt the novel as a vehicle for Leonardo DiCaprio to produce and star in, according to Variety.)" And the late Alan Cheuse reviewed in NPR's All Things Considered: "I won't deliver any spoilers here, but I can say the book moves along swiftly in the carefully controlled voice of the killer. And before you know it, you're in the middle of one of the wildest scenes in recent crime fiction: a shootout in the crypt of an Oslo church, where there's hardly any place to duck, just as in this entertaining novel, when the bullets fly." Jessie Garcia's new book, No Stone Unturned, had a different publishing journey from My Life with the Green and Gold. On the new book: "Garcia shares the story of Casey FitzRandolph, who won an Olympic gold medal in speedskating in 2002 and his sister, Jessi, who was diagnosed eight years later with stage IV breast cancer. The FitzRandolphs brought glory to the United States in the form of gold, yet left their home country in search of alternative medical treatments." And our Downton Abbey table is popping at least one book, The Wit and Wisdom of Downton Abbey, collected by Jessica Fellowes. The Austenprose blog called it the #1 stocking stuffer for Downton fans. The ALA Youth Media Awards dominate our top 10 this week. The Caldecott (art) winner was Finding Winnie, the Newbery (writing) was Last Stop on Market Street, a rare win for a picture book, and the Coretta Scott King award was for Gone Crazy in Alabama. Had Phoebe still working at Boswell, we probably would have had a pop on Bone Gap, the Printz Award winner. She's been a big fan of the book and hand-sold a lot of copies. And congrats to Jason Reynolds and Brendan Kiely, who visited Boswell last fall and had a Coretta Scott King Honor, Reynolds for two books, no less. All the winners here. Our buyer Amie's take: library's are loving nonfiction. This week's Journal Sentinel book page features American Housewife, stories by Helen Ellis. Jim Higgins writes: "Don't play poker with Helen Ellis, unless you plan on borrowing bus fare to get home: She's a successful high-stakesplayer. But do read American Housewife, her new collection of stories featuring or told by wives: funny, biting, frequently dark, and deeper than they might initially appear. Think Megan Mullally's Karen Walker character (from Will and Grace) meets Shirley Jackson. In the print edition, Amy Driscoll of the Miami Herald reviews The Guest Room, by Chris Bohjalian. Driscoll notes the setup is a bachelor party thrown at a suburban home that does not end well. "But we can't predict just what a disastrous turn the party will take. Within the first few pages of The Guest Room, the latest novel by prolific author Chris Bohjalian, the booze-fueled bacchanalia that began as the fulfillment of men's fantasies turns into a Helter-Skelter-like nightmare." Also originally from the Miami Herald, Connie Ogle profiles Val McDermid, most recently author of Splinter the Silence. Ogle notes: "Crime writer Val McDermid has never been the victim of cyberbuollying, but she's well aware of the effect it has, often on women...'I find it disturbing and fascinating in the way you see a road accident happening in slow motion.'" New Email Newsletter, New Couch, New Orchid Bag.